A unique combination of magnesium and essential oils formulated to aid restful sleep. 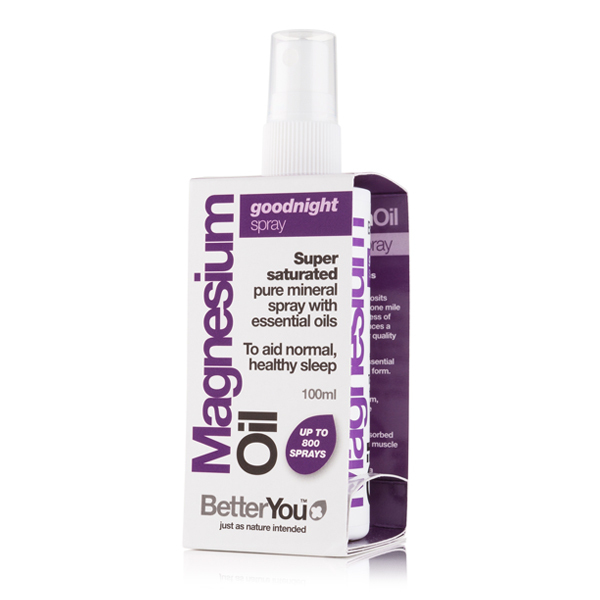 Magnesium Oil Goodnight spray combines magnesium chloride with essential oils of chamomile, clary sage, grape seed and bergamot. The essential oils soothe your senses while magnesium calms and relaxes your body to help aid normal restful sleep. Zechstein Magnesium is absorbed immediately when sprayed onto skin, replenishing the body with this essential mineral which helps promote overall wellbeing and relaxation and relieve muscle tension and cramping. Spray onto the body and massage well into the skin. Apply directly to restless muscles 30 minutes before sleep to clean skin, ideally after bathing or showing. 10 sprays delivers a minimum of 180mg (51% RDA) of optimally absorbable elemental magnesium together with essential oils. 100% natural source and is suitable for those who are on a diabetic or coeliac diet. Officially approved by the Vegetarian Society.